A mission to deflect asteroids that might threaten Earth has begun its final design and assembly phase, according to a news release. NASA is testing a technique meant to protect the planet from an impending asteroid strike, and it’s a satisfyingly simple one: They’re gonna slam the ship into the rock. The Double Asteroid Redirection Test (DART) will head to a two-asteroid system, consisting of the 800m-wide Didymos and the 160m body orbiting it. The spacecraft will crash into the smaller asteroid, called “Didymoon”, at 6km/s, or 21,600km per hour, in an attempt to deflect it. This might sound alarmist, but we’ve written a lot about the real threat posed by asteroids. Even a 20m-wide rock, such as the one that exploded over Chelyabinsk in 2013, could damage a city and injure hundreds of people. 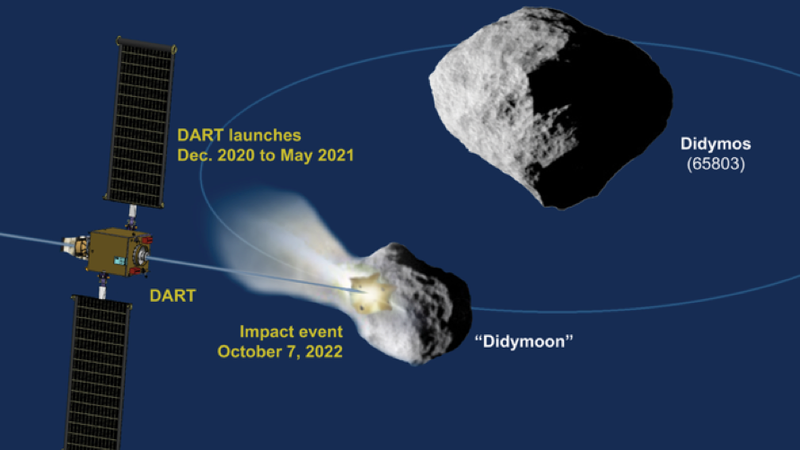 Perhaps, if scientists detect a threatening asteroid with enough lead time, then a mission such as DART could change the asteroid’s course so it avoids Earth. DART will launch some time between December 2020 and May 2021. It will rely on a NASA Evolutionary Xenon Thruster – Commercial (NEXT-C), a lighter-weight solar electric thruster, to spiral out of Earth’s orbit and onward to Didymos. It will arrive at the system in October 2022. Cameras and navigation software will direct the spacecraft into the smaller rock. The collision will hopefully change the asteroid’s velocity by a teeny bit, but enough that scientists would detect the change with Earth-based telescopes. Don’t worry about Didymoon changing course to hit Earth or anything like that. Currently, it orbits Didymos once every 12 hours. The DART scientists expect that their mission, if successful, will decrease that orbital time by eight minutes. This is just a test to determine whether such a method might work. Governments can’t just send a mission like this whenever they feel that an asteroid is a threat, though. Those hoping to divert an asteroid would still need data about it, such as what the rock is made of. That requires better asteroid observations and simulations, something the US government currently lacks. We’ve written repeatedly that America isn’t ready for a major asteroid impact. Though tasked with cataloguing 90 per cent of the asteroids larger than 140m in diameter, researchers are perhaps only a third of the way there — and there could be issues with the current data. We need better observation strategies. DART won’t be of use against an enormous asteroid that appears out of nowhere because we weren’t observing it. But the experimental mission could help determine whether the deflection strategy is even feasible. At the very least, slamming a spacecraft into an asteroid feels like the kind of American-flag-waving-science the US craves. I hope there will be video.